In April 1677, Robert Turner, Robert Zane, Thomas Thackara, William Bates, and Joseph Sleigh, all Quakers and residents of Ireland, purchased one whole share of proprietary (one tenth of West Jersey) from Edward Byllynge and his trustees. 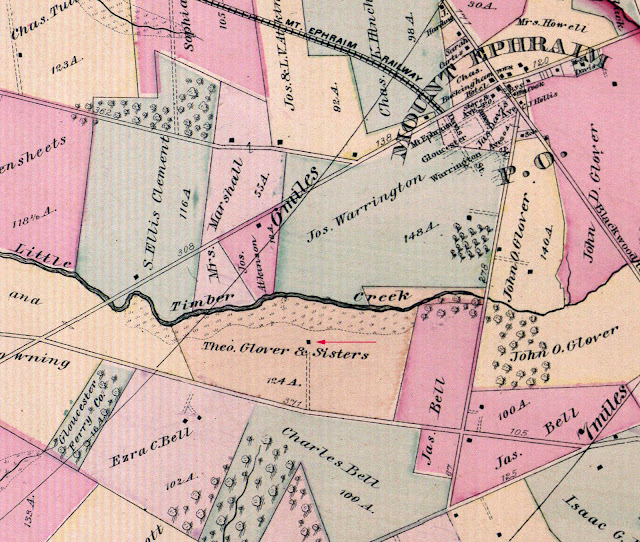 These proprietors chose to locate their settlement in the third tenth, located between Pennsauken and Big Timber Creek—today’s Camden County—which became known early on as the Irish Tenth (Prowell 1886:30). This group of Quakers had originally fled from England to Ireland to escape religious persecution, but nonetheless they soon became known as Irish Quakers. During 1681, the group arranged to sail to West Jersey on board YE OWNERS ADVENTURE, arriving at John Fenwick’s Salem Colony late in 1681, where they spent the winter. The following spring, the settlers moved north along the Delaware River until they arrived at the mouth of Newton Creek. Moving up the stream, the Quakers chose a site on the north shore of the rivulet and founded Newton Colony (Leap 1982:6). As part of his proprietary holding, Newton colonist Robert Zane took up 500 acres of land in the fork between Little Timber and Big Timber Creek and then sold the same land to newly arrived John Hugg in 1683, recorded in February 1686 (Clement 1877:284; West Jersey Deed Book B:103; Surveyor General’s Office, Revel’s Survey Book, 55). This transaction represents John Hugg’s first land purchase in the New World and his plantation extended more than a mile up Big Timber and Little Timber Creek (Clement 1877:284). He continued adding to his property holdings until he possessed more than 1,300 acres (Surveyor General’s Office Survey Book H:261). John Hugg remained tenured at his farm until his death in 1706. In his will, John devised the homestead plantation to his sons, John and Elias. He ordered that the two brothers share the land with each possessing a moiety or half-interest in the entirety divided evenly along the lane leading to the Hugg Plantation (now Browning Lane) (New Jersey Wills 6H). Son John received the half on the Big Timber Creek side and Elias the portion along Little Timber Creek, which included the father’s homestead. At this house, Elias maintained a store for the watermen who navigated Big Timber Creek in flatboats and scows. Whiskey and tobacco sales were plentiful at the store, and many unseemly events occurred here as the rough and tumble clientele waited for the wind and tide to change (Clement 1877:289-290). Secondary genealogical sources indicate that Elias’s birth occurred in 1668 and that he married Margaret Collins, daughter of pioneer settler Francis Collins, sometime prior to 1695 (Hugg Family Genealogy website; Clement 1877:76). Elias and Margaret’s children include three daughters: Sarah, Mary, and Rebecca; and a son, John. Margaret died in 1723, perhaps in childbirth with John or Rebecca (New Jersey Wills 6H; Hugg Family Genealogy website; West Jersey Deed Book EF:145). 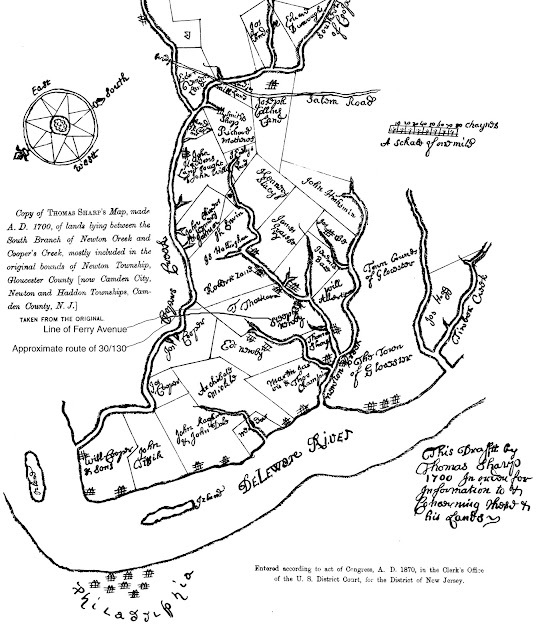 In December 1712, Richard Bull and Thomas Sharp, two of the Highway Commissioners for Gloucester County, received petitions for a road between the head of Timber Creek near Upton and the original crossing of the Salem Road over to “…the King’s Roade to Gloucester” (Stewart 1917:15-16). The road began at “…Porter’s Mill [near the head of navigation on Big Timber Creek] and from thence falling into the Old Roade that went to Burlington and along the same over Sheeyanees Run from thence to other [Otter] branch and thence over the hills to Beaver Branch by John Huggs land thence to the brick kills [kilns] upon Elias Huggs land and from thence upon a straight course to the little Bridge [bridge over Little Timber Creek]…” and on the Kings Road to Gloucester (ibid.). The blazing of this road followed, in part, the lane leading to Hugg’s plantation and now known as Browning Lane, changing the already extant Hugg’s Lane into one course of an official public road. It seems unusual and perhaps significant that Elias Hugg’s son, John, is listed as a party of this transaction, since Elias alone held the property as a devisee of his father’s will. The oldest portion of the house on the property, and the section featuring a gambrel roof, could have served as Elias’s residence prior to his father’s death in 1706. At some point subsequent to Elias’s moving into his deceased father’s house after 1706, Elias’s son, John, became of age and likely moved into the house and resided there until he and his father sold the plantation to Buckley. Elias included his son in the transaction presumably because John was the de facto possessor of the house and farm. If the house did not serve as a one-time residence for Elias, then he probably had it constructed for his only son, John, upon reaching his majority. Since the property hosted brick kilns and Elias’s nephew, Gabriel Hugg, is listed as a bricklayer in his will and other legal documents, Gabriel’s participation in constructing the house is strongly suggested (New Jersey Wills 205H). Buckley received less than the estimated 400 acres in Elias’s share of his father’s plantation because the Huggs sold 100 acres to John Jones, 30 acres to William Crowes, and 12 acres to Enoch Allison (West Jersey Deed Book EF:246). After the sale, Elias Hugg reportedly relocated across the Delaware River and took up residence in Philadelphia, although no documentation could be found to confirm this contention (Hugg Family Genealogy website). Buckley retained the property for ten years before selling it to Samuel Harrison in November 1751 for £300, making himself a tidy £200 profit (West Jersey Deed Book O:103). Perhaps during Buckley’s ownership of the property, he added the new rear section to the original gambrel-roofed house, thus increasing the property’s overall value. Samuel Harrison and his wife Abigail held the plantation until December 1756, when they sold it to Samuel’s brother, Joseph Harrison, for a mere 5 shillings and “…the kind love and natural affection which they have to bear unto the said Joseph Harrison…” (West Jersey Deed Book N:475). In 1759, Joseph Harrison and William Hugg applied to the West Jersey Proprietors for a resurvey of the original John Hugg Plantation as it was devised to John and Elias Hugg in 1706. The resurvey verified the chain of title for the property, the boundary lines, and the acreage contained within those boundaries. The written record of the resurvey reveals small parcels that were added to and subtracted from the plantation over the years. The deputy surveyors also confirmed that the land contained an overplus of 31 acres and 11 perches or 31.069 acres, which Joseph Harrison dealt with by subtracting the same amount from another untitled proprietary land grant given to him in November 1755 (Surveyor General’s Office Survey Book H:261). Joseph Harrison retained ownership of this plantation until his death in November 1761. In his will, written during the same month and year as his death, he devised the property to his two daughters, Mary and Rebecca, to be equally divided between them when they reached their majority age. It appears Joseph’s wife predeceased him. He directed his brother Samuel to provide care for the two girls until the reach maturity and, as a reward, Joseph granted his brother the right to “…possess my Little Place untill [sic] my Daughter Rebecca arrives to age (which lies on ye Little Creek)…” (New Jersey Wills 747H). It is unknown who rented Joseph Harrison’s “Little Plantation” after Joseph’s death. However, acting in his role of possessor and caretaker of the Little Plantation, in 1764 Samuel presumably contracted for an addition to be constructed on the west side of the gambrel-roofed house on the plantation, perhaps to make the property more attractive to a tenant. Built in a similar patterned brick style as the original house with a modified Flemish bond, the addition almost doubled the size of the dwelling space. The construction date is clearly shown in the western gable of the addition, but no initials are present, which strongly suggests that the person who ordered the addition constructed did not reside in the house. Amazingly, a comparison of this house, after completion of the 1764 addition, with photographs of Harrison Manor, Samuel’s residence in Gloucester Town, reveal the two houses are strikingly similar in appearance. Harrison Manor underwent demolition in 1941 and inexplicably did not become a structure selected for the Historic American Building Survey (HABS) prior to its destruction. ﻿﻿﻿﻿﻿Rebecca Harrison, Joseph’s daughter, was born in February 1757 and in January 1780, after reaching her majority, married Robert Blackwell, an Episcopal minister from Philadelphia (Wallace Papers, Vol. 4). Her sister Mary married Israel Morris Jr. in May 1774, but died before reaching her majority (Gloucester County Deeds H:492). Unfortunately, Rebecca met a similar fate as her sister, dying quite young in February 1782, two days after giving birth to Rebecca Harrison Blackwell (Wallace Papers, Vol. 4). As a result of her death, Robert Blackwell gained title to the lands that Rebecca received from her father. Blackwell continued his ownership of Joseph Harrison’s homestead as a rental property. In July 1800, he advertised the property for rent and indicates in the advertisement that John Burrough resided there (Pennsylvania Gazette 16 July 1800). Five years later, Blackwell and his daughter and their respective spouses, sold the former Joseph Harrison homestead, located west of the cemetery house, to Benjamin B. Cooper and John Gill for $6,600 (Gloucester County Deed Book H:492). 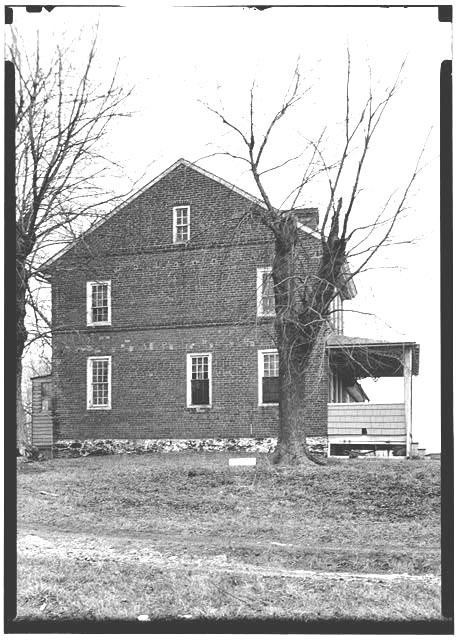 The sale occurred at the time and place stated in the advertisement, but Sheriff Denny did not draft two deeds of sale for a portion of Harrison’s property until April 1784. One deed acknowledged Samuel Hugg’s purchase of a 35-acre tenement parcel for £126 (Gloucester County Deed Book D:182). The second deed transferred title of the 155.75-acre plantation to William Eldridge in exchange for the winning bid of £935. The Hugg and the Eldridge bid represent the only two successful partial purchases of William Harrison’s land, so Sheriff Denny scheduled a second Sheriff’s Sale, which occurred on 26 March 1785 and presumably at Hugg’s Tavern (Gloucester County Deed Book L:504). Ephraim Tomlinson placed the winning bid of £960 for the 287.25-acre plantation described in the advertisement (above) as possessing a brick house. Denny drafted the deed for this sale during April 1785 and Ephraim Tomlinson became the titleholder for Joseph Harrison’s former “Little Plantation” (ibid.). Of the three remaining parcels—two 35-acre tenement lots and the 70.75-acre plantation containing a gristmill and a frame house—only a deed for the gristmill property could be located; William Eldridge acquired this tract in August 1792 (Gloucester County Deed Book K:473). Ephraim Tomlinson retained the former “Little Plantation” property and used it as his homestead farm. He died sometime prior to 22 March 1810, the date his heirs proved Ephraim’s will, drafted during November 1808. In his will, Tomlinson divided his plantation, the former Elias Hugg property, into two pieces with the upper portion devised to his grandson Warner Tomlinson and the lower section, including the Hugg/Harrison house, to his other grandson, Joseph Tomlinson, both sons of Ephraim’s deceased son, Joseph Tomlinson. Ephraim’s estate inventory value exceeded $6,300, indicating Tomlinson was a man of some wealth during his lifetime (New Jersey Wills 2790H). Joseph Tomlinson presumably worked and resided on the plantation his grandfather devised to him. His tenure ended in October 1835, when he sold the property, containing 119.70 acres, to Chalkley Glover, a resident of Deptford Township, probably as an investment and rental property (Gloucester County Deeds N3:484). Chalkley Glover died intestate sometime during late 1873 or early in 1874; his daughter, Sarah, applied for an estate administration bond in January 1874 (Camden County Estate Index). Since Sarah applied to the Camden County Surrogate’s Office for the Estate Administration Bond, it may indicate that Chalkley lived at the “Little Plantation” at the time of his death. Chalkley’s heirs, Theodore and Sarah Glover, retained the “Little Plantation” for another 40 years. 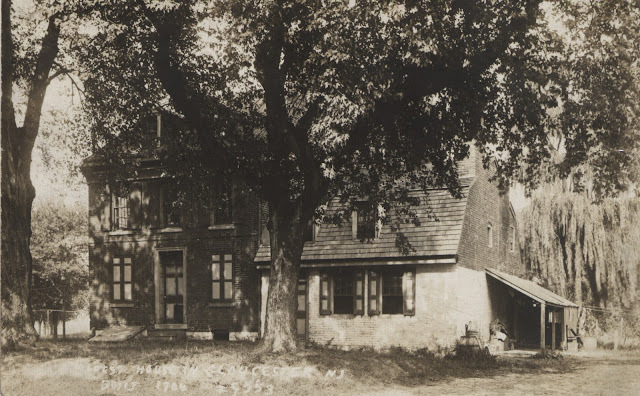 In January 1914, the siblings struck an agreement with John G. Scofield, a resident of Centre Township, to purchase their late father’s former property, including the Hugg/Harrison house (Camden County Deed Book 383:621). The agreement dictated a series of payments to be made monthly. Finally in August 1918, Theodore and Sarah issued a deed of purchase for the land and house; Scofield paid $15,000 to them (Camden County Deed Book 434:168). At this point in time, Theodore Glover and his sister, Sarah B. Glover, resided in Deptford Township, Gloucester County, perhaps in their father’s old house. Three years later, during August 1921, Scofield sold 63 acres of the former Chalkley Glover farm and the old Hugg/Harrison house to St. Mary’s Roman Catholic Church of Gloucester City for $41,300 for use as a cemetery (Camden County Deed Book 490:599). While the Camden Diocese controls New Saint Mary’s Cemetery today, the former Hugg/Harrison/Glover house continues to serve as the cemetery’s offices, as it did when the church burial ground first opened in 1923 (Giglio 1987:233). 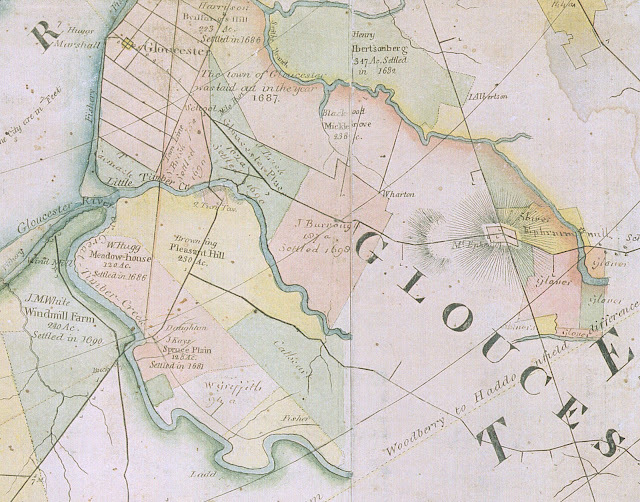 A select group of prosperous landowning families descended from and holding extensive kinship ties to the original settlers dominated life in Gloucester County during the eighteenth century. …This landed gentry held the largest tracts along the tidal creeks and tributary streams that defined the region’s distinctive cultural geography. Here they operated plantations of more than three hundred acres, partly cleared for planting and with meadows fenced for pasturage and wooded tracts and cedar swamps. Their estates were each valued at nearly £1,000. The original proprietary families and their kin controlled the landing places on the creeks that linked the county to markets on the Delaware River and in Philadelphia. Near these creeks landings they built their two-story brick and frame houses with bricks produced locally by a kiln [already] established in 1712 by the Huggs near Gloucestertown. Gradually, the old farmsteads succumbed to twentieth-century developments. 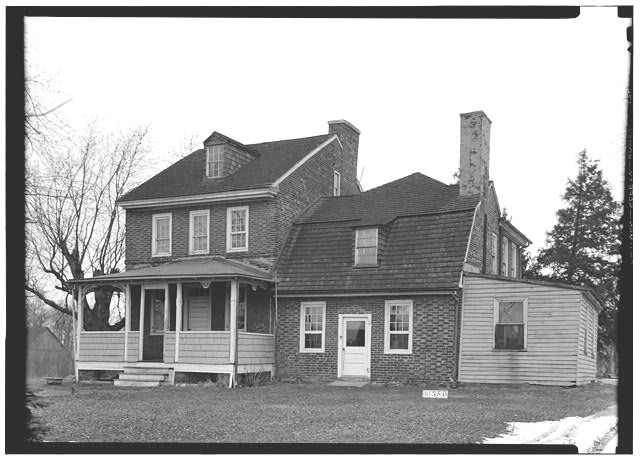 Along the Pennsauken Creek, the former 1775 Morgan/Hylton homestead, commonly called Mount Pleasant, met its demise in 1964 when the solid waste landfill operators sold the stone and timbers to a man from Moorestown, who built a modern house with the materials (Fichter 1991). All of the known colonial houses along the Burlington County side of the creek have been demolished as well. On Cooper’s Creek, the construction of a highway ramp between Baird Boulevard and Route 30 (Admiral Wilson Boulevard) circa 1940 caused the state to raze the 1699 Joseph Nicholson house (Bassett 1977:22-23). None of the farmhouses that once lined the Pennsauken and Cherry Hill Township side of Cooper’s Creek remain. These include dwellings owned by members of the Spicer, Browning, Morgan, Day, Champion, Spicer, Stoy, and Troth families. As indicated in the table above, only Pomona Hall and the Hopkins House remain on the south side of Cooper River (Sidney 1850; Sidney undated). On Newton Creek, the Champion House burned down in the late 1960s or early 1970s. Located in the Fairview section of Camden, this house was the reputed birthplace of Betsy Ross. Gone, too, are other Champion family homes, Harrison Manor (an almost identical twin to the Hugg-Harrison-Glover house), the Mickle House called “The Willows,” the Albertson House, Atmore’s domicile, and Collins family homes. Along the tidewater portion of the Timber Creek watershed, any vestige of John Hugg Senior’s house likely disappeared when the federal government constructed the Noreg Village (a World War I defense housing development) section of Brooklawn. Along Little Timber Creek, the Clement farmhouse is gone, as are two early Harrison dwellings and a Browning family home, leaving only the Hugg-Harrison-Glover domicile. Along the north side of Big Timber Creek, all of the farmhouses have disappeared, including the John Hugg Junior house, the Kay home and two Lippincott dwellings (Sidney 1850). The Harrison family has a similar history to the Huggs in fulfilling their civic obligations by serving as sheriffs, judges, freeholders, members of the legislative council, etcetera (Cushing and Sheppard 1883:119-142). William Harrison served in the Gloucester County militia and fought in the battle of Gloucester defending his own land (Munn). William’s grandson, Joseph Harrison Junior, would distinguish himself in the nineteenth century as a Philadelphia locomotive builder and mechanical engineer who also traveled to Russia to construct railroads for the Czar (Harrison 1869). Immediately associated with Hugg-Harrison-Glover house is Rebecca Harrison, who came to possess the house after her father’s death, married Philadelphia Episcopal minister Robert Blackwell. The couple met while Blackwell served the Anglican churches located in Gloucester County. Later, when the Revolutionary War began, Blackwell chose to side with the Americans. In January 1780, with the war beginning to wind down, he married “…Rebecca Harrison, daughter of a long-prominent family of Gloucester County landowners” (McLachlan 1976:632). The Hugg-Harrison-Glover house provides the last remaining vestige of these once-important families and the vital role they played in the early development of today’s Camden County. 1977 Historic American Buildings Survey of New Jersey. New Jersey Historical Society, Newark, New Jersey. 1887 History of Bucks County, Pennsylvania. n.p., Philadelphia, Pennsylvania and Chicago, Illinois. Camden County deed books. Camden County Clerk’s Office, Camden, New Jersey. Camden County estate index. Camden County Surrogate’s Office, Camden, New Jersey. 1877 Sketches of the First Emigrant Settlers: Newton Township, Old Gloucester County, West New Jersey. Sinnickson Chew, Camden, New Jersey. 1883 History of the Counties of Gloucester, Salem and Cumberland New Jersey, with Biographical Sketches of Their Prominent Citizens. Everts & Peck, Philadelphia, Pennsylvania. 2001 Camden County, New Jersey : The Making of a Metropolitan Community, 1626-2000. Rutgers University Press, New Brunswick, New Jersey. 1991 The Pennsauken Story. The Pennsauken Township Committee, Pennsauken, New Jersey. Giglio, Reverend Monsignor Charles J. 1987 Building God’s Kingdom: A History of the Diocese of Camden. Seton Hall University Press, South Orange, New Jersey. Gloucester County deed books. Gloucester County Clerk’s Office, Woodbury, New Jersey. 1869 The Iron Worker and King Solomon. J.B. Lippincott & Company, Philadelphia, Pennsylvania. 1808/1814 A Plan of the City of Philadelphia and Environs. Annotated through December 1814. John Hills, Philadelphia, Pennsylvania. 1877 Atlas of Philadelphia and Environs. G.M. Hopkins, Philadelphia, Pennsylvania. http://homepages.rootsweb.com/~marshall/esmd100.htm [accessed 25 September 2010]. 1982 The History of Runnemede, New Jersey: 1626-1976. Borough of Runnemede, Runnemede, New Jersey. A Visit to Gloucestertown. Unpublished manuscript. David C. Munn, Gloucester City, New Jersey. New Jersey wills, Secretary of State Collection. Microform edition. New Jersey State Archives, Trenton, New Jersey. Pennsylvania Gazette. Microform edition. Pennsylvania Gazette, Philadelphia, Pennsylvania. undated Map of the Township of Delaware Township, Camden Co., New Jersey. J.C. Sidney, Philadelphia, Pennsylvania. 1850 Plan of the Townships of Union and Newton, County of Camden. Richard Clark, Philadelphia, Pennsylvania. 1917 Notes on Old Gloucester County. Vol. 1. New Jersey Society of Pennsylvania, Philadelphia, Pennsylvania. Survey books. Microform edition. New Jersey State Archives, Trenton, New Jersey. John William Wallace Collection, 1725-1854. Manuscript Collection. Historical Society of Pennsylvania, Philadelphia, Pennsylvania. West Jersey deed books. Microform Edition. New Jersey State Archives, Trenton, New Jersey. 1988 Notices from New Jersey Newspapers: 1781-1790. Hunterdon House, Lambertville, New Jersey. 1976 Princetonians : 1748-1768 : A Biographical Dictionary. Princeton University Press, Princeton, New Jersey. Thank you for you kind comments! I’m glad you are enjoying my blog. I plan to provide the history of the Harrison house in a future posting, including photographs taken before the dwelling met its demise. Keep checking back—I hope to have it posted later this week or sometime next week! Did you know it's slated to be torn down in 2016? This should rather be preserved as a historical sight and restored to it's original glory. Jerseyman. Your research and articles are fantastic. I have been looking into the history of Brooklawn, Gloucester Town and specifically the 2 Tuns Tavern that used to sit in what is now Brooklawn. Although I have found an article that talks of the tavern, the map above is the only map I have ever seen that noted this tavern. If you can share anymore information about this subject I'd love to read it. Thank you very much for your kind comments! For additional information, you should read my article titled "The Plantation Yclept Bromley." As you can see from the map, the tavern stood at the top of the hill on the Brooklawn side of Little Bridge. If you drive along Lake Drive, you can still find the swale-a remnant of the road coming up from Little Bridge-between 3rd and 4th streets, IIRC. The British maintained a mortar emplacement at the top of the swale immediately opposite Two Tun during 1777. I do have some additional material on Two Tun and other houses in the area, so if you want to send me another comment with an email address, I will be able to communicate more directly with you. Did you know that this historical house in Bellmawr dating back to colonial days, the only historical house remaining in Bellmawr, is slated to be torn down in 2016 to make way for the reconstruction of the 42/676/295 interchange. This house should be preserved with historical status and restored with donations. What can we do to preserve this house and the history of Bellmawr and Camden County? Did you know that this house, the oldest in Bellmawr, dating back to colonial days, is slated to be torn down in 2016? Should not this house be preserved for future generations? What will we do to preserve it? The state of New Jersey has plans to demolish the Hugg Harrison/Glover house at St. Marys. There is a petition at Bellmawr Borough Hall trying to save it. Please when you can, go to the main office and sigh this petition. Oh no, they can't demolish such an important house!!! Is there an online petition? Great article, and good job! I always wondered about the history here ever since I was little. It is very disheartening that these historical houses are being torn down. I understand the need for progress but having the audacity to demolish the oldest and last standing house is this area is completely ludicrous.